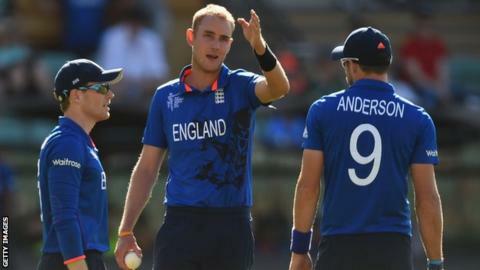 England have left seven members of their World Cup squad for the one-day series against New Zealand starting next Tuesday. James Anderson, Stuart Broad, Ian Bell, Gary Ballance, Moeen Ali, Ravi Bopara and James Tredwell missed out, while an eighth, Chris Woakes, is injured. Kent keeper-batsman Sam Billings is the only uncapped player in the squad. Only Joe Root, Ben Stokes, Jos Buttler and Mark Wood played in the drawn Test series against the Kiwis. The five-Test Ashes against Australia starts on 8 July. National selector James Whitaker said: "It is important to point out that none of these players have been ruled out of playing a role for England in limited-overs formats in the future. "This squad allows us to look at a group of players who have performed well both at county and England Lions level in recent years." Moeen has been rested to allow him to play for Worcestershire before the Ashes. Seven players are retained from the XI who played in the rain-affected ODI against Ireland in early May - James Taylor, Alex Hales, Jason Roy, Adil Rashid, David Willey, Steven Finn and Wood - plus Billings, who was in that squad. Six return after missing that Dublin game - one-day captain Eoin Morgan, who was playing in the Indian Premier League, and Root, Stokes, Buttler, Chris Jordan and Liam Plunkett, who were with the Test side in the West Indies. Four players who featured against Ireland - Tim Bresnan, Jonny Bairstow, and debutants Zafar Ansari and James Vince - are not included. England ODI squad to face New Zealand: Eoin Morgan (Middlesex, capt), Sam Billings (Kent, wk), Jos Buttler (Lancashire, wk), Steven Finn (Middlesex), Alex Hales (Nottinghamshire), Chris Jordan (Sussex), Liam Plunkett (Yorkshire), Adil Rashid (Yorkshire), Joe Root (Yorkshire), Jason Roy (Surrey), Ben Stokes (Durham), James Taylor (Nottinghamshire), David Willey (Northants), Mark Wood (Durham).